Fascia gutters are so called because they are attached to a fascia board. These are most commonly seen on customized gutters and are usually placed near the ends of rafters. They are often intended to hide the ends of the rafters from sight. These gutters are in the shape of a half open circle, and they tend to hang from the roof. They are not very common, however, since they don’t usually work very well. They often overflow easily, particularly if the gutters were not installed properly or if the roof is not level. Their poor drainage means that they have to be cleaned more often than other types of gutters. K style gutters use a ridged crown molding design that gives them a unique and sophisticated appearance. They are actually the most common type of gutter you will find, and they are excellent at draining out water and not becoming overburdened with debris and spill off from the roof. These gutters are most often shaped like the half round style gutters, but the major difference that sets them apart is the outward-facing bead. 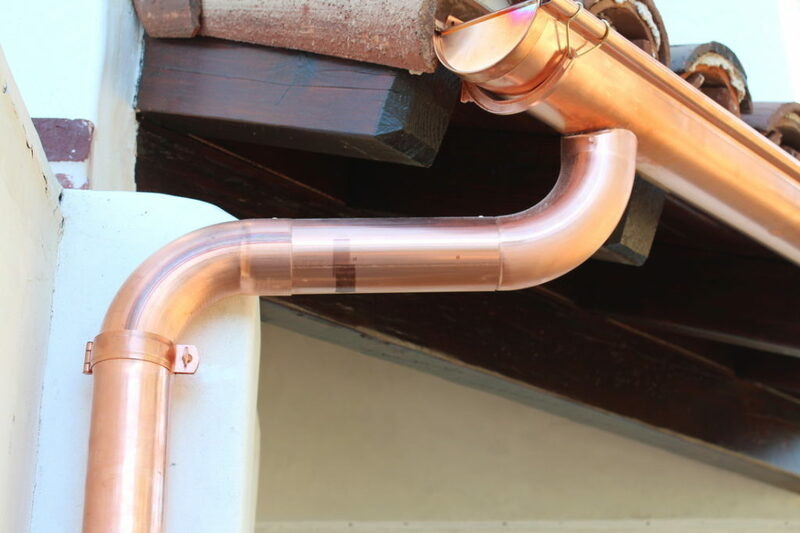 Whereas most gutters are made from some type of plastic or vinyl, European gutters are generally manufactured from copper and other materials designed to be weatherproof. You will not see wooden gutters very often. These were far more common in the past, before plastic was available. Now they are really only used in restorative efforts on old buildings.